Plants which display germination and rapid growth in wet seasons, quickly flower and produce seeds, and then wither. The success of this life form lies in the seeds, which often lie dormant until the next wet season. ... the desert tortoise and Mojave ground squirrel. Vegetation consists primarily of a creosote bush scrub community with Joshua trees and numerous annuals. The basic adaptation of desert perennials is the ability of their roots to ... Annuals. Annual wildflowers are drought escapers, able to wait out years of drought as . 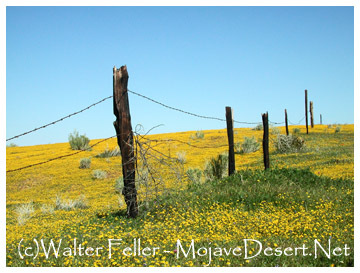 Annuals, such as goldfields carpet the rolling hills of the Antelope Valley on a good year.